It’s been a bit since I’ve been back at the blog. Work has been a little stressful. Boys have me feeling a bit more blue than green. I’ve spent more than one night hunkered down playing dominoes and having more wine and crackers than real food. What I’m saying is…I haven’t been cooking. I haven’t had much inspiration – until tonight. We here in Atlanta finally are able to reap the benefits of Trader Joe’s. I happened into one after my AM run on Saturday and was in love instantly. Not only is the wine inexpensive and plentiful….but there was an abundance of interesting fresh and frozen products exclusive to Trader Joe’s. My most exciting purchase was a bag of flash frozen veggies called "Organic Greens with Envy" – a delicious blend of spinach, edamame, broccoli, green beans, and asparagus tips. This is a great product to have on hand in the freezer. It made getting inspired for a healthy and simple pasta dish quite easy. I stir fried the veggies in a teensy bit of EVOO, minced garlic and red chili flakes. Once my pasta was done (I always use Dreamfields pasta at home for simple stuff like this), I tossed the warmed vegetables together with a tablespoon of prepared pesto. I topped the dish with some chopped green onions and shavings of Parmesan (i added the Parmesan after i took the photo of it – oops!). This dish was so tasty that I’m making a "recipe" out of it so you can make it from scratch – out of desire or lack of a Trader Joe’s – and be green, too. – Prepare pasta according to directions. 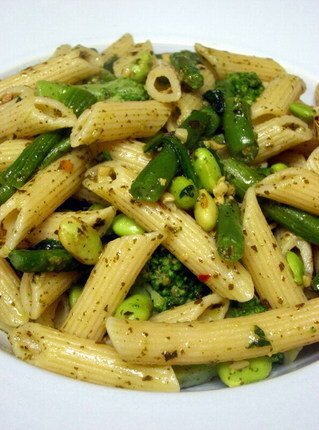 While your pasta is boiling, heat the EVOO in a medium skillet. Once hot, add garlic for 1 minute and then add spinach to wilt down. Once spinach is halfway cooked, add remaining blanched vegetables and red chili flakes. Sautee until veggie mixture is heated through. – Drain pasta thoroughly and return to original pot. Pour vegetable mixture into pot with pasta and stir until totally mixed through. Add pesto and stir until the pasta and veggies are completely coated. – Dish into servings and top with chopped green onions and fresh grated Parmesan, if desired. Serve immediately. I LOVE LOVE LOVE Trader Joes. Seriously, the place is a life changer. They have great choices and their selection is ever-evolving. Fabulous prices, sizes, ideas… I am in love! Congrats! Im from the atlanta area too, and I love having Trader joes! Do you get dreamfields at TJ’s? I have never looked for it there before. Trader Joe’s! My favorite store back home in Washington, DC (well, “mine” is located in Bethesda, MD, at the DC border, though). Your pasta dish reads and looks very tempting. Have you ever tried the Italian kind of broccoli, “rapini”, with oriecchette (Trader Joe’s sells them), garlic, hot pepper flakes and hard salted ricotta cheese grated over it? I go to Trader Joe’s waaay too often! It’s such a great store. Your dish just looks like spring. Regarding olive oil, I try to keep the extra virgin for salad dressings and such and just use regular olive oil for cooking. Not only does it have a higher smoke point, but its taste is a little more neutral, letting the food flavors come through more. I am new to your blog and wanted to say hello, since I live (near) Atlanta as well. Originally from Boston I have been craving TJs for years and years. How excited was I when they finally opened here!?!?! Your green penne looks dee-lish! This is a must try -but maybe with whole wheat pasta?